The best plants to use for hedges in Georgia are generally native plants or those fully adapted to Georgia's sub-tropical to tropical climate. Dense shrubs with attractive foliage or flowers make a visually pleasing impact, and may be utilized as hedges for privacy, partitions or garden enclosures. Georgia hedge plants thrive in warmer climates and high humidity. Saw palmetto (Serenoa repens) is well-suited for use as a hedge plant in Georgia. Native to the tropical coastal area, saw palmettos tolerate drought and salt spray. This plant is low-growing, displaying open palms with stiff fronds. Its creeping nature provides a naturally spreading barrier to landscapes. Thriving in full sunlight and moist, well-drained soil, saw palmettos also grow on drier, higher elevations like coastal dunes. 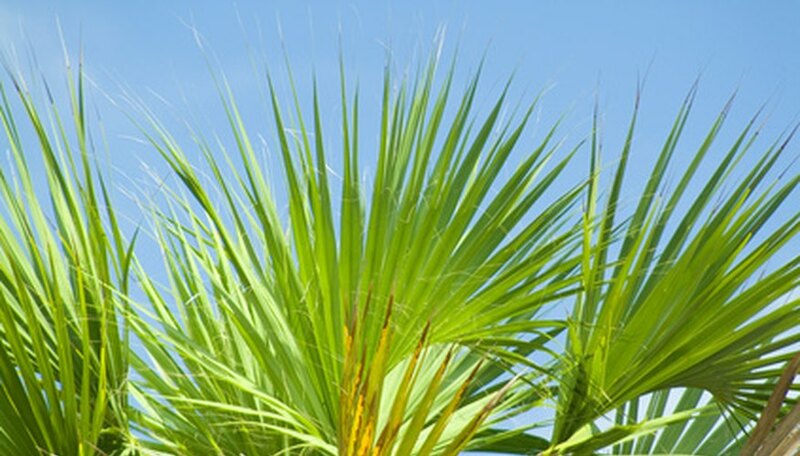 Growing to a height of 5 feet tall with a spreading width, plant saw palmettos grow in USDA hardiness zones 8a to 8b, according to the University of Georgia Cooperative Extension. Arrowwood viburnum (Viburnum dentatum) is well-suited for use as a hedge plant for Georgia as its upright branches spread to create a dense plant. Displaying dark green leaves and cream-hued flowers, arrowwood viburnum is found in wet sites close to areas of water such as streambeds. Native to Georgia, this hedge plant thrives in full sun to partial shade and prefers moist, loam or sandy soil. This deciduous shrub grows to a height and width of 6 to 15 feet; plant in USDA hardiness zones 6b to 8b, as directed by the University of Georgia Cooperative Extension. Small anise tree (Illicium parviflorum), also referred to as the yellow anise tree, adds to the Georgia landscape in the form of a hedge plant with an upright pyramidal shape. This evergreen is considered a large shrub or small tree and displays fragrant, light green foliage with tiny yellow-green flowers. Prune occasionally to maintain desired shape. Found near streams, small anise thrives in full sun to light shade with a preference for moist soil; the greater the exposure to the sun, the denser the plant becomes. Small anise trees grow to a height of 8 to 15 feet and a width of 6 to 10 feet. Plant in USDA hardiness zones 7a to 8b. Southern wax myrtle (Morella cerifera or Myrica cerifera) is highly effective as a hedge plant for Georgia due to its abundance of stems and broad growth habit. This broadleaf evergreen shrub, also considered a small tree, displays fragrant green foliage and fragrant berries in a blue-gray hue on female plants. Found in wet coastal sites and dry sands, the Southern wax myrtle thrives in full sun to light shade and prefers moist soil. This hedge plant reaches a height and width of 15 to 20 feet. Plant in USDA hardiness zones 7a to 8b.